Back to School deals are here! We have some great deals on apparel going on that you may want to move ahead of the crowd and take advantage of right now! •Crazy 8 is offering up to 60% off of the entire site. Find tee's starting as low as $2.09, dresses as low as $4.99 and denim starting at $9.99. •Gymboree is offering up to 75% off Clearance and Much More. 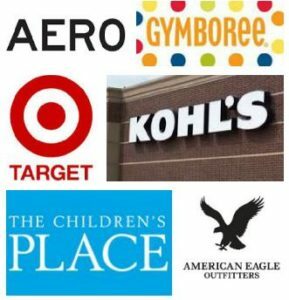 •Carters is offering $5 doorbusters on graphic tees and shorts plus an additional 20% off of your $50 purchase with the coupon code: EXTRA at checkout. •Old Navy is offering 40% off one item with the coupon code: ENJOY at checkout. Plus they are having a uniform sale where polos start at $5, pants at $10 and More! •Macys: save up to 20% with the coupon code: SALE and check out the semi-annual clearance and sale with prices up to 75% off. •American Eagle Buy One Get One 50% off AEO Jeans, Pants and Shorts. •Aeropostale is offering 30% off a single item with the code: THIRTY at checkout. •Target.com is offering 40% off school uniforms when you use promo code UNIFORMS40 at checkout.